Lest We Forget. 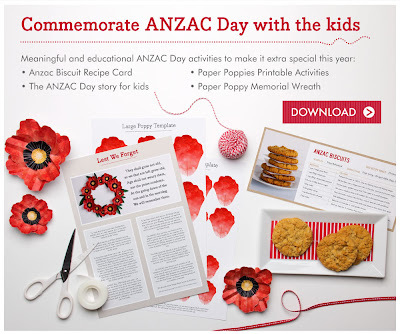 Help commemorate our fallen soldiers by heading on over to Mooo for free Anzac Day printables including an Anzac Biscuit Recipe Card, Anzac Day Story for Kids, Paper Poppy Printable Activities and Paper Poppy Memorial Wreath. Please pass on to your littlies the importance of this very special day.